Sherlock Holmes‘ birth date is widely agreed to be January 6, 1854 (based on the scholarship of Christopher Morley, American journalist, novelist, essayist, poet, and founder, in 1934, of the Baker Street Irregulars-the oldest literary society dedicated to Sherlock Holmes). Perhaps no other fictional character ever created possesses the enduring popularity and seeming immortality of Sir Arthur Conan Doyle’s Sherlock Holmes. Indeed, Conan Doyle himself was ultimately unsuccessful in killing him off. Nearly 100 actors have portrayed Holmes in film, on stage, television, and radio since before 1900. Almost 20 years ago, in The Universal Sherlock Holmes (1995), Ronald B. De Waal listed over 25,000 Holmes-related productions and products. The number has no doubt increased exponentially since 1995. There are two well-received television series alone airing in 2014 with Sherlock Holmes as the protagonist: Elementary (set in present day New York City) and Sherlock (set in present day London). In fact, episode 2 of the long-awaited series 3 of Sherlock aired tonight on BBC One. Sherlock is scheduled to begin airing its series 3 in the U.S. on Masterpiece PBS on January 19. • many eBooks, also both original canon and pastiches. • The Final Solution: A Story Of Detection. • Teller Of Tales: The Life Of Arthur Conan Doyle. And, naturally, you can of course find the original 56 short stories and 4 novels featuring Sherlock Holmes authored by Conan Doyle (published between 1887 and 1927), and available in book, audiobook CD, downloadable eBook and downloadable audiobook formats including The New Annotated Sherlock Holmes, The Penguin Complete Sherlock Holmes, and The Annotated Sherlock Holmes: The Four Novels And The Fifty-six Short Stories Complete. Interesting note: The copyright in all of Conan Doyle’s works expired in the United Kingdom in 1980 and are public domain there. 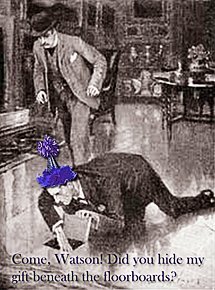 On February 14, 2013, noted American Holmes scholar and attorney Leslie S. Klinger filed a suit against the Conan Doyle estate asking that the court acknowledge the characters of Holmes and Watson are in the public domain and no longer protected by copyright in the United States. Less than two weeks ago, on December 23, 2013, the court ruled in Klinger’s favour. The Conan Doyle estate is considering an appeal to protect the work until all copyrights expire in 2022. Nevertheless, Klinger still plans to finish work on a book of original short stories featuring characters and other elements from Conan Doyle’s work which he is co-editing and planning to publish in the fall of 2014.